The ironically titled follow up to 2000's HEADS by underrated SF Bay Area act 40 Grit is finally here, and proves that it was worth the wait. The band boldly has gone in a tighter, more focused (and melodic) direction, without sacrificing the power of their debut. New addition Andy Green on drums seems to be a catalyst, driving the band harder than before. Another new element is the use of sequenced keyboard parts, which have added depth and texture to the band's sound. Most importantly, the emergence of James Santiago as a lead vocalist, who is belting out these superior tunes with more verve than on their previous effort, is a key aspect on this disc. His delivery, combined with stronger hooks and tighter arrangements, has propelled this act to new heights sonically. Add in the crushing grooves of Kevin Young on Bass and monster riffage (as well as some killer backing vox) from guitarist Chris Anderson, and this sophomore effort potentially could put this band in the top echelon of Hard Music acts worldwide. Hopefully, this will be the case! It's rare that a disc from any band has strong songs from beginning to end, but this one has some that really stick to the listener's ribs. Best of the bunch are such rippers as "Bomb Bottom," "Because of You," the title track, "Nothing to Remember" (featuring some atypical acoustic guitar and awesome harmony vox), "Higher Trades" and "A Part of Me" (more amazing vox) are all keepers. The 2 best tracks, however, are "Pieces" and the 1st single (as well as their 1st-ever video) "Only Human." Even if the rest of the disc were just so-so, these tunes would more than make up for it. Add those tracks in to this fine collection, and this is as strong a second record these ears have heard from any band in years! 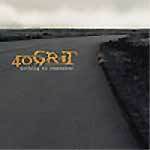 Far from being Nothing To Remember , the new 40 Grit CD is a memorable leap forward for this group. The record definitely will be in this writer's Top Ten List come year's end! (Note: worth seeking out is the Japanese version with the bonus track "Soul and Snot", another killer track). Go out and grab a copy of this -- besides, it's only $9.98 at retail! For more info, log on to 40grit.com!